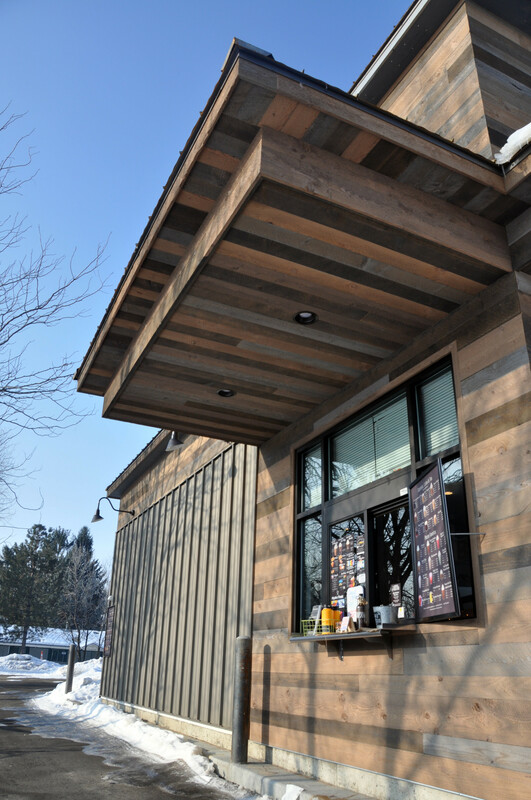 If variety is the spice of life, then certainly The Human Bean coffee shop knows how to do it with this beautiful application of various ranchwood™ and AquaFir™ colors. ranchwood™ Southern, Western, Shale and Yellowstone, along with AquaFir™ Shale — complete with Circle Sawn texture — round out an eye catching, substantial display. ranchwood™ is put through a production process that creates aesthetically beautiful rustic wood siding and authentic reclaimed barn wood and reclaimed lumber alternatives. Typically less expensive than antique reclaimed barn wood, ranchwood™ offers uncompromising rustic wood beauty. The vertical contrast of the metal siding let’s the natural ranchwood™ reclaimed siding flow. Circle Sawn texture brings the variety of ranchwood™ colors together, promoting a warm Idaho look even during cold winter days.